Breakthrough Learning was selected as one of a hand-full of charities supported by the 2018 Three Counties Cycle Ride organised by the Rotary Club of Bracknell. The event was held on the first Sunday of June and the glorious sunshine attracted well over 600 riders. Breakthrough Learning fielded a team of cyclists, looking resplendent in their branded t-shirts, who took on the 15 mile route and one super-fit rider who completed the 54 mile challenge. 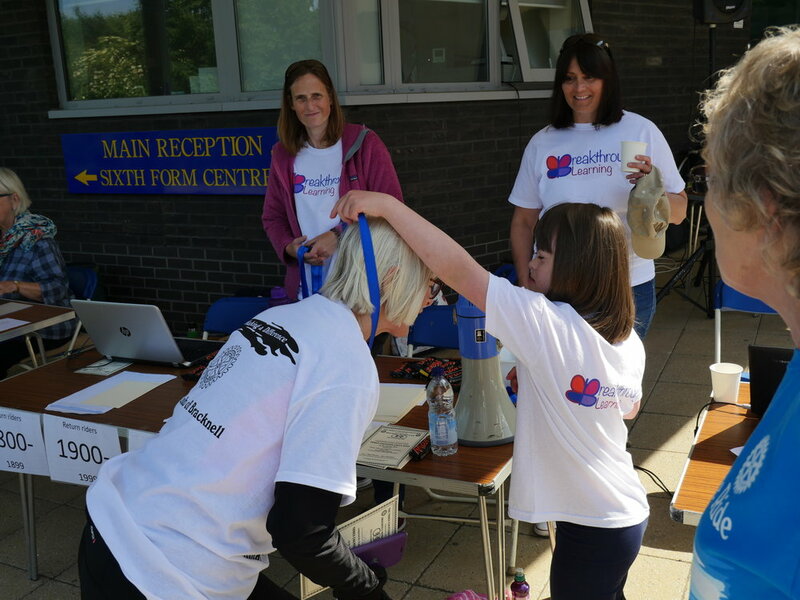 Volunteers from the charity also stepped up to help the organisers with the cyclist registration and handing out medals, certificates, Mars bars and water to those who successfully completed the event. The ride was extremely well organised and the Breakthrough Learning riders and volunteers had a really enjoyable day. A huge "Thank you" to the Rotary Club of Bracknell for inviting us to be one of their nominated charities for this event. The donation will help us to work with even more children, developing their ability to learn how to learn and helping to realise each child's true potential.